Traditional cookies get a tasty twist! Traditional cookies get a tasty twist! Cut-out cookies complete the holiday cookie platter. 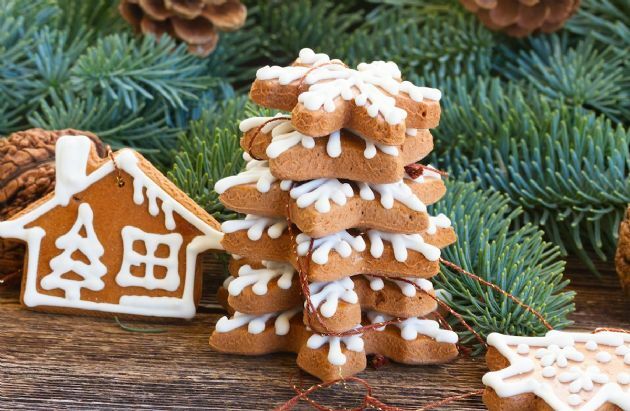 The smell of these spice cut-out cookies baking evokes the holiday spirit. They are easy to roll out, especially if you chill the dough for about 30 minutes. The cookies can be served plain, but a little decoration with icing gel or your favorite cookie icing gives them a more festive look. I have included an easy decorator's icing that works well. You can control the amount of sugar used in the icing by making it rather thin and then "painting" the cookies rather than spreading it on thickly. The size of the cutters used will affect the nutritional information as well as the yield, but the calculations are based on about a 2 inch round cutter. This recipe was created by Patricia Huller C.C.E., M.Ed., a culinary instructor and healthy baking expert from Cincinnati State's Midwest Culinary Institute, especially for SparkRecipes. Beat the butter blend using a mixer until softened. Add sugar and beat until smooth. Add molasses and orange juice and blend. Mix the flour with the spices and then add to wet mixture. Stir until dough is formed. You may roll out dough at this point, but the whole wheat flour will absorb the liquid from the orange juice and blend the flavors better if let to chill for 30 minutes. Divide the dough in half and roll one half to 1/8 inch thickness. Flour the cutter and cut out the cookies. Place on cookie sheet that has been lined with parchment paper or use silicone baking sheet liners. These will not spread much so they can be placed about 1/2 inch apart. In order to assure a more evenly baked cookie, place one cookie sheet on the upper third of the oven rack and the other cookie sheet on the lower third oven rack. Bake for 5 minutes and then shift positions, and turn cookie sheets front to back. Bake another 5 minutes. Cool on rack. Be sure to cool completely before decorating. Mix all ingredients in small bowl until the mixture is smooth and easy to spread. Add more milk if needed.